Yoga as Therapy … or Yogopathy? Yoga aims to help us regain our psycho-physiological balance by removing the root cause of disharmony – and that root cause lays beyond the physical level. Dwaitam, or duality, is the main initial cause of imbalance. Duality, in the simplest terms, is seeing ourselves as separate from the Universe around us – as an independent entity without relationships, and isolated from causes and effects. It is that disconnect from “reality,” the reality that we are in fact intimately connected to everything, which starts the ball rolling on all our troubles. Disease on all levels results from this ignorance, manifesting throughout the various koshas (the five bodies, or discernible “aspects” of man, such as the physical body, the energetic body, etc.) as various disorders depending upon the propensity of the individual. Tiruvalluvar, the great Tamil mystic, says in his “Thirukkural” (also referred to as the Tamil Veda), “Look for the disease, look for the primary cause of it and then treat it”. To use yoga as therapy means to use all the tools of yoga, not just the physical techniques, to cut to the core and find the real cause. Similarly sage Vashistha tells Lord Rama in the “Yoga Vashistha,” another text in the library of classic yoga literature, that the essential disease is that of being caught in the vicious birth-rebirth spiral. He also says that this essential disease can be remedied only by Atma Jnana, or the inner awareness of the higher Self. 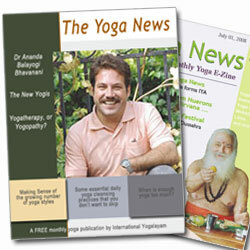 Yoga as therapy guides the patient farther toward this ultimate realization. If we do not aim to correct the underlying skewed perception of reality in the individual, along with their physical problem (which is just the manifestation of a psycho-somatic disassociation), then we are not practicing yoga chikitsa, or yoga therapy. Managing and suppressing the symptoms with physical yoga techniques is really only just as good or as bad as any modern allopathic approach that focuses on symptomatic management without ever getting close to the real cause of the disorder. How many doctors look at the emotional and psychological issues that are the primary cause of the problem in so many of their patients? When yoga therapists make the same mistake of merely treating the physical symptoms without remedying the cause, it can hardly be seen as using yoga as therapy. I prefer to call it YOGOPATHY. An example of yogopathy is when shavasana, the corpse pose, is used to manage patients of hypertension, quoting research that has shown that this pose reduces blood pressure. Real yoga chikitsa would try to look for the primary cause of the patient’s hypertension and try to tackle that, while at the same time using shavasana for symptomatic management. Without an attempt to do so, it is not yogic therapy. It is merely yogopathy. Another common example is the familiar use of the chandra nadi pranayama (left nostril breathing) to lower the blood sugar, or the use of the right nostril surya nadi pranayama to relieve broncho spasm, without looking for the real cause of the patient’s diabetes or asthma. I recently encountered a yoga therapist who said that he advised his patients to do their prescribed pranayama while watching television to help them save their precious time! When queried on the fact that prana, or energy, flows where the mind goes, he retorted that he was talking of therapeutic pranayama whereas I was talking of spiritual pranayama! If this is the prevailing attitude of yoga as therapy today, then THE ANCIENT RISHIS MUST SURELY BE TURNING IN THEIR SAMADHIS! “Don’t worry Casey, yoga will survive. After all, it has never been considered something that the masses are capable of fully comprehending, simply because of the magnitude of commitment and hard work that it demands to properly understand it (not to mention proper guidance).